"18th Century Counterpoint and Fugue"
"Double and Triple Counterpoint and Fugues" - cover A page from "Double and Triple Counterpoint and Fugues"
The study of Counterpoint, (two or more melodies accompanying each other) is an ancient pursuit, and the greatest examples are in the pre-20th century literature. J.S. Bach is universally recognized as the greatest master of counterpoint and it is primarily his works that are presented here. 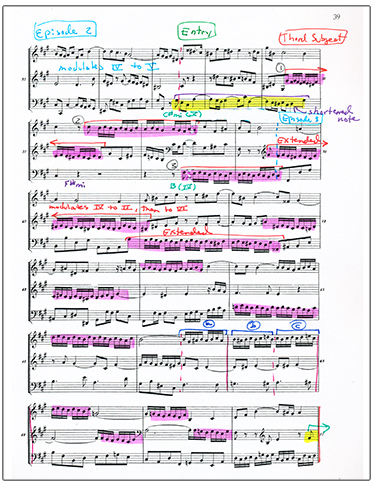 I created these scores using colored ink pens and highlighters (to teach myself). The approach to studying counterpoint that has remained the cornerstone of the academic world for centuries is memorizing "rules" that had been concocted by music theorists who had studied Bach, and then tried to homogenize what they found with rules. 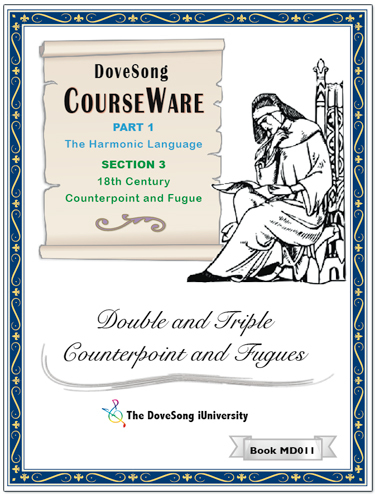 With the study scores in this series, students wishing to learn the technics of counterpoint will realize that rules are not the answer, and that only by learning directly from the original scores (the blueprints that Europe's greatest composers have left us) can we gain an understanding of the technics that were used by the masters themselves to create counterpoint. As I taught myself about counterpoint by studying these works, I began realizing that the rules were really just nonsense. You don't compose music using rules! There are methods and technics, but not rules. The only way to learn the techniques of the masters is to study the scores themselves! This is what the masters themselves did. Therefore, I began creating my own set of scores with melody, motives, subjects, contersubjects, all the important melodic information color-coded, and with the sections, sequences, sets, interludes, developments and expositions duly noted, along with notes from the authors that I could rely on. The motto of the composition classes in 20-century universities had been "You have to learn the rules in order to break them." The motto for the 21st century will now be "there are no rules." Today, with state-of-the-art technology, it is possible to learn the techniques of the great masters firsthand, throwing aside the idea of "rules". The great opportunities for true music education are here now and the iUniversity is my offering to the cause. The internet has now facilitated a new kind of teacher. These study volumes will begin becoming available during 2012.